We must develop innovative approaches to sustainability if we are to ensure the survival of our species. The sad reality is that our incremental applications of sustainability has proven to be insufficient to address the civilization altering threat of climate change. Despite great strides, we are confronted with devastating political realities especially in the United States where Trump has been a major impediment to sustainability. However, it is also true that corporate efforts extend beyond the reach of this pessimal presidency. It stands to reason that the world's largest corporations should bear the brunt of the burden. The 250 biggest listed companies account for one third of all man-made greenhouse gas emissions. According to a Thomson Reuters Financial & Risk white paper, many of these companies do not have concrete goals to address climate change. Nonetheless we are seeing waves of corporate goodness that give us reason to hope. Some companies are standing up to Trump. Recently Harley Davidson responded to Trump's trade war by moving part of its operation abroad earning the ire of the liar-and-chief. There are some fundamental approaches to reigning in emissions that are essential. This includes carbon pricing, however, despite the overwhelming logic their is an underwhelming lack of political will. According to Tom Murray, the Vice President, EDF+Business at Environmental Defense Fund, environmental innovation is thriving in corporate America. As he explained in a Forbes article we are seeing this innovation despite the disturbing lack of leadership in Washington. Murray cites Walmart's Project Gigaton which includes 400 suppliers with operations in more than 30 countries. These companies have set ambitious greenhouse gas emissions reduction targets. The goal is a billion tons of emissions reduction in the next decade and a half. According to Murray this is, "the most ambitious and collaborative effort ever"
Many of these companies are looking to innovative technologies to meet their emissions reduction goals. 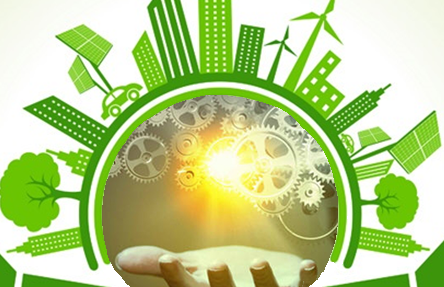 According to an EDF survey more than three quarters of executives polled confirmed that companies are looking to game changing technology innovations to enhance their sustainability efforts. These innovations include blockchain, sensors, data analytics, mobile ubiquity, dematerialization, automation, and sharing technologies. An even larger percentage claimed that such technological innovations, "will compel businesses to improve their environmental impact on their own, regardless of any external pressures." As explained by Murray, these technological innovations are "turbo charging transparency, corporate responsibility and effective action". The scope of the problem we face demand that we are also innovative in the way we imagine sustainability. If we are to move forward the business community and the general public must disabuse themselves of the irrational conception of the world being composed of infinite resources and unlimited waste assimilation capacities. Part of the problem is related to the corporate world's the single minded focus on profits. If sustainability is to succeed it must be directly linked to profits. Given systemic constraints like short-termism and shareholder primacy, some argue that we need to see more profound changes to address the urgent situation we face. This is the logic laid out by Raz Godelnik in a Triple Pundit article. He explains, "we can’t win fast with a sustainability-as-usual mindset". He cites Bucky Fuller who said, "you never change things by fighting the existing reality. To change something, build a new model that makes the existing model obsolete". Godelnik also quotes Alex Steffen who said: "In the face of both triumphant denialism and predatory delay, trying to achieve climate action by doing the same things, the same old ways, means defeat. It guarantees defeat." The point being that we need a new paradigm that both espouses urgency and is technologically capable of addressing the challenges we face.